Anyone know why Just Cockatiels have been put on a password? Is there a specific reason? I find it sad because there is a lot of good information on there...and I also spent $10 to get access to it! I actually kept good contact with her. She used to be in Florida, but she moved to New Mexico and only kept a few normal grays and is now working on breeding geese. This was 1-2 years ago though. I don't know. Maybe she's wanting to make it a pay-to-see site again, or maybe she's taken it down because she wants to turn the content into a book and make money off it that way. When she set a password on it before, it only lasted for a short time and then she made it free again. But you've already paid once so you shouldn't have to pay again. My suggestion is to contact her and ask about it, and depending on what she says you can ask if she'll give you the password since you already paid. She's still on Facebook under the name Susanne Russo with a picture of Noodles the cockatiel as her profile picture, so you can probably reach her that way if you don't have a better way of contacting her. I messaged her on Facebook and she gave me her number to call her. We spoke for about 15 min and I honestly can’t believe she still remembers me. She knew me when I was 15 with my chick that was stuck in the egg. She remembered when I wanted to buy a bird from her. About the book. She said she wants to turn it into an ebook. There is a password on the website because nobody appreciates her work to dontate. She did give me the passwords to both her sites though! Good for you, you now have access! 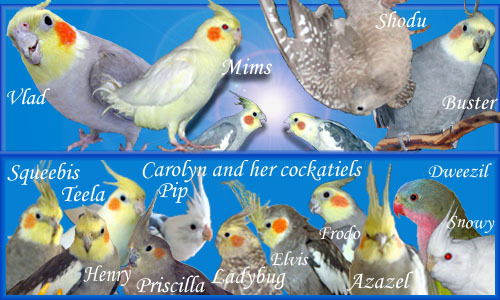 Is this the lady that accepted your flock of cockatiels ? If so, when did they go? She didn’t take them in at the end.